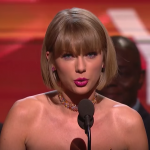 With the Grammy Awards Show coming up later this month, a video featuring the acceptance speech of Taylor Swift from last year’s Grammys has been turned into an inspirational video. This video is meant to embolden girls. Why is this message targeting girls and not boys? How are boys supposed to feel about this video? This entry was posted in Videos by ptomizawa. Bookmark the permalink. Boys are supposed to feel and know that boys are not the only people that can do great,important things. I agree. Girls can be important too. I think she means the same for boys, she just doesn’t say it because the speech is meant for women. I disagree because a lot of people already think and know that boys and men can do great things. This speech targeted girls for a reason. I agree with we know that men can do great thing but girls can do the same thing that boy’s can do. I don’t agree with you James. This video was meant for girls. I don’t agree with you James. It targets girls. Exactly! But she is indirectly also targeting boys. She means it for girls, I can agree with that, but she is saying it in a way that gives the message to boys as well. This targets girls because a lot of people know and think that only boys can do important things, like be astronauts or be president. That is not true.Boys are supposed to feel AS important as girl, not more or less important. We can all do anything we dream of. I think because Taylor Swift is a girl and also some people are not giving girls to same rights as boys. I think that boys are suppose to sad because some people didn’t give the same rights to girls. I really agree with what you said. Boys should respect that they are not better or worse than girls, they are equals. I think the message is targeted towards girls because sometimes some people say that girls aren’t strong enough or smart enough and they try to throw you off. But I think Taylor Swift was trying to tell girls that those people are wrong and girls can do anything. but don’t boys have to do that to? This video is targeting girls because a lot of girls are being left out in the world with there rights.But boys are going to feel upset because this video targets girls and not boys. I do not know why the video is meant for girls, because the girls are treated the same as the boys now. I think the boys should feel bad about his video because the boys have not done any to girls recently. I think this video is not only for girls, it’s also for boys. It targets girls because to embolden shy girls and girls who are afraid to speak up. Boys will feel like why is she favering the girls and not use. To help girls not be afraid to follow their dream and not to get shut down because of what other people say or do. Also that boys are not the only people that can do good thing too. Many people think that girls aren’t smart or strong enough to do things that boys can. Taylor Swift was probably trying to tell people how girls are as smart and as strong as boys. As a boy I don’t know if why this video is only targeting about girls and not boys because boys and girls are the same and and can change the world. I think she should target boys and girls(not males and females) and tell them that we should make the world equal for everyone no matter what gender, skin color or anything else. It should be for the new generation of kids. I think the message is targeting girls and not boys because sometimes people think that only boys do the important stuff and the girls can’t do it, but the message is girls can do anything if they believe. I think the message is supposed to make boys feel like they are not the only ones who can do important things.